I can't believe I'm submitting a wallpaper hahaha, but well I have never been a prolific waller either way. Like every year now, I always try to wall when I'm out on vacations with my family, since I have no internet there, the only thing I can do is wall, it's amazing what you can do when you're not procrastinating! Last year I started this and the year before I did this one. KHR is one of my fave mangas and I feel horrible I never paid tribute to its awesome story and badass characters, I mean, seriously, Hayato was my last anime bishie. Then I got caught in kpop. I used this scan, and GOSH, TRY WALLING USING A I LAPTOP THAT HAS A 1024x600 RESOLUTION. My laptop died last year so I stole my mom's HP mini laptop. The screen is absurdely small, like you open photoshop and the menu and tools use half of the screen. Aside the pains of getting this done, and not to mention the small scan, I'm uber glad with the results. CAN YOU BELIEVE THIS IS NOT KUNIE?! Good wall from Fran and with a unique way of using colours! The colors are funky! YEAH! 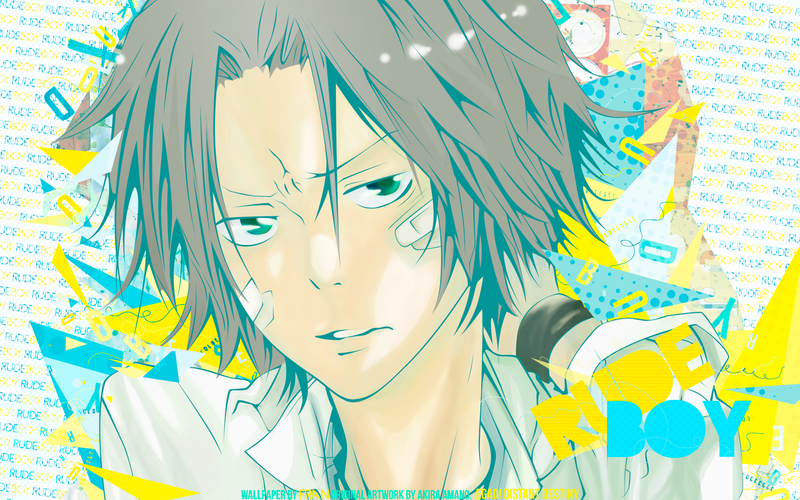 Gokudera <3 I'm glad you walled again! Love it ~ ^^ lovely colours! I think Dera takes up just a little bit too much space and it could be more balanced with more of just the background, but I love the funky colours and crazy patterning! ? You make very good combine background pattern with the colors! Good Job! So lovely! Hayato, you're rude indeed. ? So much looooove~ c: Great wall! IDK, I LOGGED IN TO SAY THIS IS NEAT & MY INNER KHR STAN IS SHOWING. Any who, the colors are really nice & I just love the pop-ish feel the wall has going. My favorite thing tho, is thawesomee text, it's. Hhhnnngg, it's neat. Nice colouring thanks for sharing!